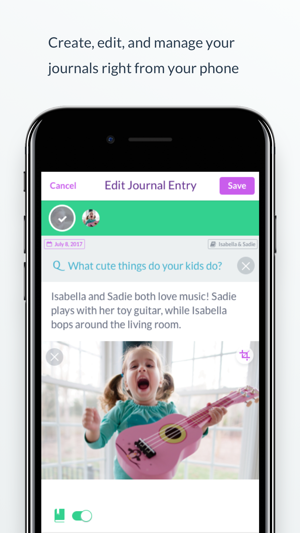 With the all-new Qeepsake companion app, parents can more easily edit and enjoy their Qeepsake memories, add new photos, answer missed questions, and more. 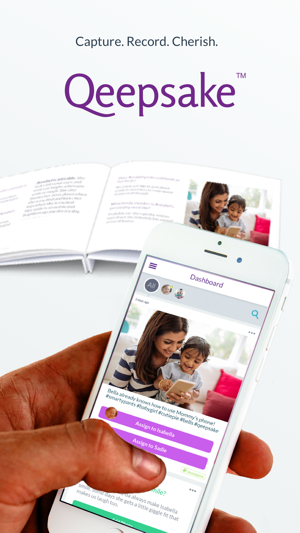 Plus, you can now automatically import your kid-related posts from social media and order a beautiful hardcover, softcover, or expandable Qeepsake Book anytime you're ready. Support: Loving the Qeepsake app? Please leave a review! Want to help us improve the app? Please send an email to support@qeepsake.com. This release includes improvements to the general performance, reliability, and user experience of the Qeepsake app. UPDATE: I received my book. I love that I can type memories/journal entries in Qeepsake at any time. I’ve enjoyed the questions and the app works pretty well. BUT I just went to place an order for the book (I’ve been doing a couple entries per week for my daughters first year) and the book is $170 for hardcover and $94 for a softcover. That is CRAZY! Almost $100 for a softcover book that I can’t even really customize? For example, there are some pages with just one question/response and no picture, and it takes up the entire page because they enlarged the text to a huge font. I would much rather have that small response show up on another page. On top of the crazy price, they charge $15 for shipping. $15 to ship a softcover book? I put so much energy into writing responses all year for my daughter’s first year, and I feel so disappointed that the book is going to cost so much. Thanks for previewing your book and we're sorry about the price shock. The cost is associated with the number of pages you have in your book. It sounds like you have close to 150+ pages. There are two ways to decrease the page count. First, you can use the date selection tool to scope down the number of entries in the book. Secondly, you can deselect specific entries - http://bit.ly/2Tvba4C - like the single page entries. The single-page entries show up if they can't fit on a page with the other content such as it's a single text-only entry in between entries with photos. Qeepsake has a hierarchy rule that all entries stay in chronological order. Shipping is more expensive because we go with 2-3 day shipping (in the U.S.) and every order comes with a tracking number. If you need help scaling down your book or have questions about the process, please email us at support@qeepsake.com, and we can help you out. I think this is a great way of keeping track. It’s easy to upload photos & memories. I gave this 4 stars because I think some of the questions are not appropriate based on the age of my baby. I’ve just left those questions unanswered & may come back to them when they apply. Also, I feel like there should really be a way to load more than one photo per comment. For example I loaded baby shower pics. I’d rather be able to just upload all of them with one comment rather than having to do one at a time with separate comments. One thing I dislike is that the app doesn’t show the date of the photo/comment you’ve uploaded. It says 2 weeks ago. I want to know the date. You have to edit the comment in order to see the actual date. Right now, my baby is only 8 weeks old. I will probably order a book at age 1. I will be very curious to see how it comes out. I hope it is of high quality and resembles a baby book. Thank you for taking time to give us such great feedback. 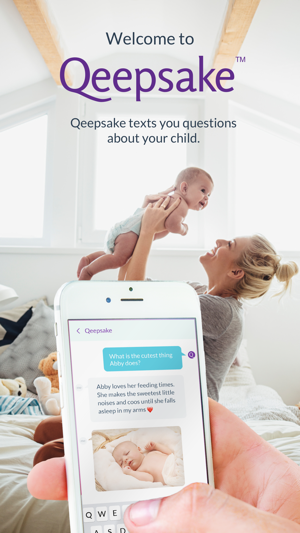 We strive to ensure that Qeepsake’s questions are as age-appropriate as possible for most parents, though admittedly since child develops at a different pace, Qeepsake’s questions may not always be relevant to every parent. If there are specific questions you think are off, feel free to email us at support@qeepsake.com and we’ll relay your feedback to the content team. We appreciate your suggestions about adding multiple photos and viewing the date of an entry, and we will take your feedback into account as make improvements to the app. Wow, I love this app! It is so nice to have a quick way to record precious memories with my baby. I love that while I’m nursing I can write a quick description, attach a photo, and it’s saved! Like most new moms, I take so many photos of my baby! But why? What am I going to do with them besides cry looking at them when I have to go back to work?! Well, now I have a place to bring meaning and life to each photo!! I just can’t say enough about this app, and I’ve told all my mommy friends about it. Two suggestions though: I’d like to be able to add more than one photo to a post. And it would be so cool if while you are adding entries, you could be seeing virtually how it’s filling up your baby book. Like have a digital view of the book you’re creating. It would keep me motivated to continue to write more and purchase the book in the end. Thanks Qeepsake!! !